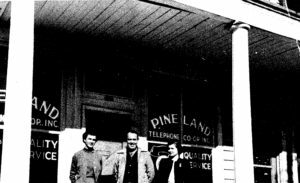 Organization of Pineland Telephone Cooperative was accomplished September 8, 1951, by a group of interested people from Emanuel and Candler Counties at a meeting in Swainsboro. Officers and Directors were also elected at this time. After a number of meetings, the new Board of Directors approved purchase of the Midville, Adrian, Twin City, and Stillmore telephone exchanges and with the help of other interested people from these counties, memberships were obtained and equity certificates sold to begin operation of the cooperative. Application was made by the cooperative to Rural Electrification Administration (REA) for the first loan, $625,000. This money was to be used for purchase of the first four telephone exchanges and to begin construction of new facilities. Rural Electrification Administration approved the first loan in March of 1952, which was the fourth such loan approved in Georgia by REA and the first such loan approved for a telephone cooperative. At the end of 1953, which also marked the end of the first full year of operation, the cooperative was serving 1,383 subscribers. At the end of 2002 the cooperative was serving 13,479 access lines from ten exchanges in the rural communities and towns of Metter, Adrian, Bartow, Cobbtown, Davisboro, Kite, Lexsy, Midville, Oakpark, and Twin City. These exchanges also provide services to the communities of Aline, Pulaski, Meeks, Norristown, Scott, Covena, Nunez, Stillmore, Wesley, Garfield, and Coleman Lake, and in the counties of Candler, Burke, Emanuel, Johnson, Jefferson, Washington, Tattnall, and Laurens. The Cooperative has been successful in obtaining the necessary funds through the Rural Electrification Administration, now renamed Rural Utilities Service (RUS), to continue its construction program and keep abreast of service demands. Every subscriber of the cooperative has one party telephone service through modern digital switches. The Co-op’s service offering includes custom calling features, access to the internet, high speed DSL Internet, Pineland Long Distance and is a partner with Alltel providing cellular service to the are. The Cooperative provides employment for seventy regular and part-time people.